New Balance have taken the cricket market by storm with their innovative TC and DC collection. Spearheaded by Joe Root, England cricket captain, and Ben Stokes, they have dominated the cricket bats and equipment market. 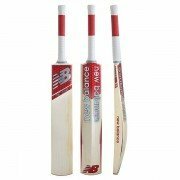 New Balance or NB as they are known in cricket sell a wide range of bats, pads, gloves, bags and shoes. They are All Rounder Cricket's number one selling cricket brand.